The Holo-Krome Fastener On-Line Catalog features Socket Head Cap Screws, Shoulder Screws, Dowel Pins, Allenuts, Pressure Plugs and more in Inch and Metric sizes. Dimensional Data as well as part numbers for easy reference are supplied. 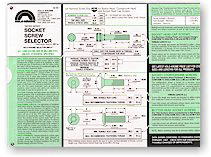 Looking for Holo-Krome Screw Selector Cards? Here they are!!! Holo-Krome Collars? When fastener talk turns to quality, one brand is mentioned without fail: HOLO-KROME. And little wonder - for Holo-Krome fasteners have been performing in some pretty tight spots, under tremendous pressure for years, even decades. There is no compromising when it comes to quality. None. BENEFIT: Traceablility. Each fasteners has its own quality controls number tracing it all the way back to the steel mill. Made in the USA. BENEFIT: Thermoforged® for inherently stronger parts under dynamic loading conditions. BENEFIT: The highest torque/clamping available in the entire industry. BENEFIT: Roll Threading, not thread cutting, for stronger, more precise radiused root and run-out threads for increased fatigue life. BENEFIT: Technical Support for those tough questions from design and applications engineers: over the phone or on site! BENEFIT: SPC (Statistical Process Control). Today's term for the latest in quality control. Dimensional Data is for information purposes only!! Not all sizes shown are available as standard HK parts. Please see product information for available sizes. Holo-Krome - featuring the highest quality Socket Head Cap Screws, Shoulder Screws, Dowel Pins, Pull Dowels, Pressure Plugs, Allenuts and more.